VRM-400 modem is an ideal upgrade for your Enterprise or Industry applications. 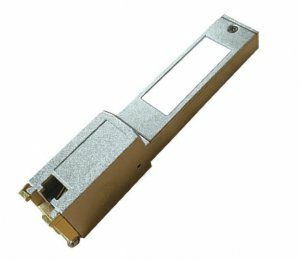 VRM-400 is an integrated SFP bridge modem, a MSA compliant Small-Form Factor Pluggable module that enables traditional Ethernet switch, media converter and other network appliances to connect beyond typical Ethernet coverage (100 meters). Incorporated with the latest VDSL2 technology, this SFP modem can be easily adapted to existing applications with existing 2-wire cable, such as phone line, to avoid the cost of rewiring. It can drastically extend the Ethernet service on UTP wire with distance up to 3000 meters, and even with the rate of 100Mbps speed up to 400 meters on a standard Cat 5e 2 wire cable. The SFP modem is also designed with flexible profiles settings for system integrator, or user, to select based on their unique applications and environment requirements. Symmetric profile can be applied as a standard Ethernet connection while Asymmetric profile can be used for other services like Video streaming or IP surveillance services which require high traffic flow in an uni-direction configuration. The SFP modem also supports Telco grade noise cancellation techniques like Interleave, high SNR profile, and retransmission that can effectively eliminate the noise impact to ensure your service/control messages can securely deliver in a harsh environment.